9:25:13 AM Michael: you goggled! at your age? Disclaimer: The following post is fictional. It does not represent an admission to any illegal activity or wrongdoing. About 6 months ago my wife and I decided to cancel our cable and tivo subscriptions in an attempt to save some money. We weren’t quite sure how painful it would be to go without. At the time, we were probably watching 30 -40 hours per week. Which I’m guessing slightly more than the average family in our demographic – but maybe slightly less than the average “geek” household. It’s hard to come up with a good mental estimate, with tivo’s ad skipping ability you can squeeze in an extra 20-25% more TV. Going into the experiment we were aware that Canada doesn’t really have any viable free or paid online TV watching options; Hulu and most of the content on US network websitess is blocked from Canadian IPs; until very recently iTunes only hand a handful of uninteresting Canadian TV shows available; the 3 major Canadian networks (and their specialty channel subsidiaries) only have tiny low-res video of a select few shows, not really suitable for full screen tv viewing. So, even if we had a media centre PC hooked up to the TV, there would not be a legal option for us. I pushed to kill cable because I was fairly certain that we would be able to find illegal torrents of most of the shows we watched and would be able to watch them easily xbox 360’s xvid playback functionality. I did not expect it to be as easy as it was. At least 90% of the shows that we watch regularly – everything from House and Battlestar Galatica to Gossip Girl and the obscure (it’s only aired on a handleful of stations nation-wide) Canadian comedy Less Than Kind – were available online within 12 hours, in high definition and on a 10mpbs connection a half an hour show usually downloads in less than half an hour. Our TV watching habits remained virtually unchanged – instead of pulling up a show on Tivo, we’d load up the xbox. Over these 6 months it’s become clear to me that torrenting TV is actually better than cable TV in most ways. Standard digital cable is not HD and regular cable doesn’t air some US TV for weeks or months after it’s original release – you have to pay for to the highest tier (beyond “full cable”) to get channels like HBO-Canada and even then some shows are still unavailable. Here’s where it gets a little more geeky. It is totally possible to manage a torrent based xbox 360 media center by sharing a folder on any computer. I wanted to come up with a “better” solution. Both of the computers that Internet Super Mom and I use are laptops, because they’re laptops, they’re often in sleep mode and sometimes they leave the house. So it’s not entirely practical to have torrents continuous downloading and we found it annoying to make sure a laptop was on in order to stream to the xbox. Luckily, I have an under-utilized Debian web development server sitting in our Son‘s closet that is always on. It has a LAN connection separate from it’s internet connection, so any heavy streaming between computers would not affect it’s outgoing dev related traffic. TorrentFlux – a PHP based bittorrent client. It supports remote login and has integrated torrent search across a number of different torrent search engines. That means, I could queue up torrents from my iPhone whenever I remember to watch the latest episode of a show. Unfortunately, it doesn’t support RSS feeds which would make keeping up to date with a season a little easier, but this isn’t a major problem. GeeXBoX’s uShare – Is a DLNA media server for Linux, AKA it can stream stuff to your xbox. The install was a major headache, don’t ask me for help, my selective memory has erased all of the gory details. Even though it’s in alpha, it’s very stable. Anyways, we’re back on cable. The only reason we decided to go back to is because got a great win-back deal: 2 months free, 5 months at $20/mo. We did not re-subscribe to Tivo. It’s hard to say if we’ll stay with cable after the promo period. With the availability of torrents, the subscription is hardly worth more than $20/mo. I feel like standard-definition cable tv is going to take a serious drop in price of the next 2 – 5 years. The strangest thing about going back to cable is that we seem to be watching less TV than ever. We are probably only actively watching around 10 – 20 hours per week. We still torrent, but because there is always “something on TV,” it seems less important to have a fresh supply of torrents. If we happen to be home while one of “our shows” is on we’ll watch it. Missing a show is not as big of a deal as it used to be – we aren’t quite as likely to torrent it as we would have been before. … has got to be sneaking into a computer lab at the University of Manitoba in highschool (around ’95 or ’96) with a couple of friends to play Warcraft II:Tides of Darkness over their IPX network. The worst part was, because the machines were ghosted (or some archiac version of ghost) on boot up, we had to do a fresh install of the game everytime. Though this did do a great job of covering our tracks when we left. I tried to watch a live stream of Revision 3’s Tekzilla yesterday, at revision3.com/watch. I was under the impression that Tekzilla was going to a Live format. To my dismay, they were simply broadcast the recording of Tekzilla. This meant getting to see Patrick Norton, redo portions of the show, over and over and over and over again; and other tedious “behind the scenes” stuff. Maybe this is just a baby step, testing the waters of their streaming infrastructure. But they’ve certainly got a long way to go before they’re on par with the old TSS. 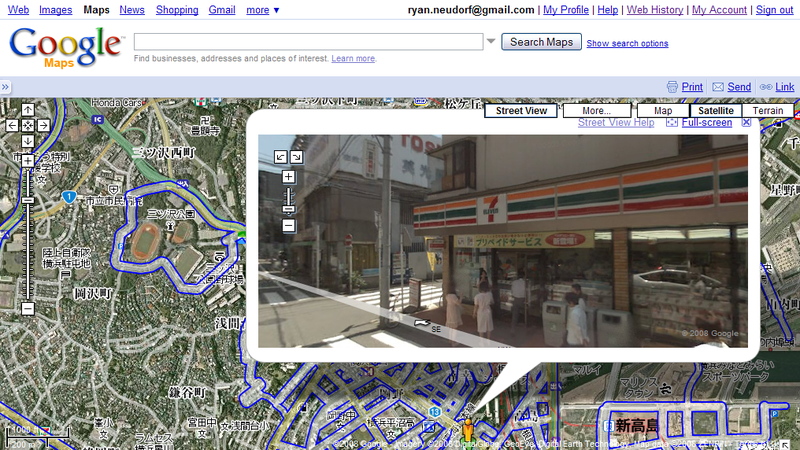 For some reason Google’s maps of Japan show the locations of 7 Eleven stores.